AIM: To assess whether laparoscopic repair of perforated peptic ulcer disease offers patients an improved outcome. METHODS: Patients undergoing repair of perforated ulcer over a 12 month period were included in the study. Parameters studied were total operative time, urinary catheter and abdominal drain utilization, post-operative analgesia requirement, time to normal diet and time to mobilization. RESULTS: The study included 24 male and 9 female (median age of 54.2 years; range 34-82). 19 patients underwent laparoscopic repair and 14 conventional open repair. Total operative time for laparoscopic surgery was 61 mins (median) compared to 57 mins for open surgery. No patient undergoing laparoscopic surgery required open conversion. Laparoscopic repair enabled the earlier removal of the abdominal drain (median: 2.2 days* (lap) vrs 3.8 days (open) and urinary catheter (median: 2.2 days* (lap) vrs 3.7 days (open). In addition patients required less post-operative intravenous and/or intramuscular analgesia (time to oral analgesia: 1.2 days* (lap) vrs 3.8 days (open). Laparoscopic repair also enabled earlier return to normal diet (median: 2.3 days* (lap) vrs 4.8 days (open) and quicker mobilization (median: 2.6 days* (lap) vrs 4.1 days (open). Patients undergoing laparoscopic repair were also discharged earlier from hospital (median: 3.1 days* (lap) vrs 4.3 days (open). 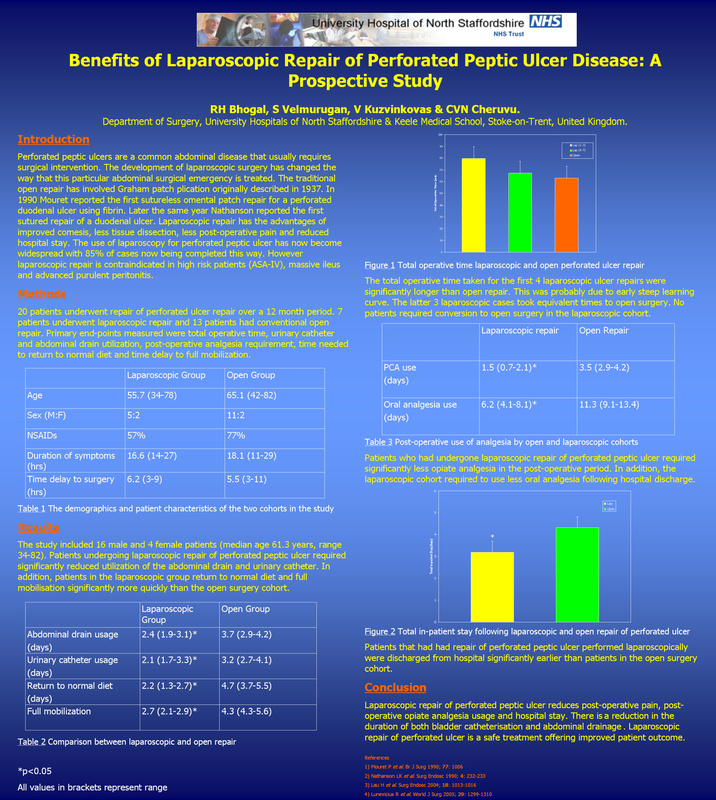 CONCLUSUION: Laparoscopic repair of perforated ulcer is a safe treatment offering improved patient outcome.